Have you ever been on the road and had a diaper blow out just as you're on the freeway with no exit in sight? Just imagine- Your child is having a tantrum, you have to take the car seat cover off and clean or find something to put it in until you could clean it. AND you have to wait a whole day until it dries! Silverflye's Piddle Pad is made of Waterproof Tested Material to enhance and encourage Potty Training and Child Independence. Establishes Stress Free Environment in Car and Tantrum Free Road Trips with your Child. Newly designed Piddle Pad and its innovative absorbent technology design WILL Protect Your Child's Car Seat and Car Seats Instantly. Waterproof design captures liquids from diaper leaks and Potty Training Accidents. ● Composed of an inner layer of Breathable absorbent sponge that allows liquids to pass through to a layer of cotton, and an outer waterproof PVC anti-skid leather. You will not find this technology anywhere else today because Silverflye is the only company manufacturing this type. As soon as this is delivered to your door, take it out of the box and pour 8- 12 ounces of water on it. Notice how good it is at absorbing water. Why would we suggest you do something like this? We are so confident in its ability to perform! When you click the buy button you're going to receive this product in a few days and guaranteed yourself a stress free environment in the car with your little one! ULTIMATE SAFETY- This seat saver was crash tested at a federally certified facility ensuring that it meets and exceeds all safety regulations set forth by the National Highway Traffic Safety Administration (NHTSA) and performs within the safety criteria regulated by FMVSS 213. We crash test this product semi-annually and it has ALWAYS met and exceeded the stringent federal safety standards. All before and after crash test images, videos and final certified summary reports are available. NEW ANTI-LEAK BUCKLE HOLE PROTECTION- This Piddle Pad is the only of all waterproof car seat covers having COMPLETE 360 degree buckle hole protection. We've contained the opening into a very narrow slit- just enough for the buckle to fit through for maximum protection. Thousands of customers use these potty training pads while potty training their toddler. This seat saver waterproof liner provides substantially more coverage for the car seat buckle hole than all other child car seat protectors. ENHANCE AND ENCOURAGE POTTY TRAINING- Only Waterproof Tested Car Seat Pad with Anti-Skid Leather Material enhancing Potty Training and Child Independence. You will save so much time, the single most valuable asset when having a busy life with kids. Your toddler will feel confident in the car with this potty protectors beneath them. Just take this Car Seat Liner out of your car, put it in the washer and you're done! No more hours cleaning car seat and waiting a day for the car seat cover to dry. NO FLAME RETARDANTS OR ANY HARMFUL CHEMICALS- Consider buying this car seat piddle pad for each car you own, as this liner for car seat has been tested extensively and fits all car seat brands including Britax, Graco, Summer Infant, Chicco, Clek Foonf, Evenflo, Safety 1st, Peg Perego and more. We use the safest materials when manufacturing these waterproof car seat protectors,using nothing which could affect your child's skin. 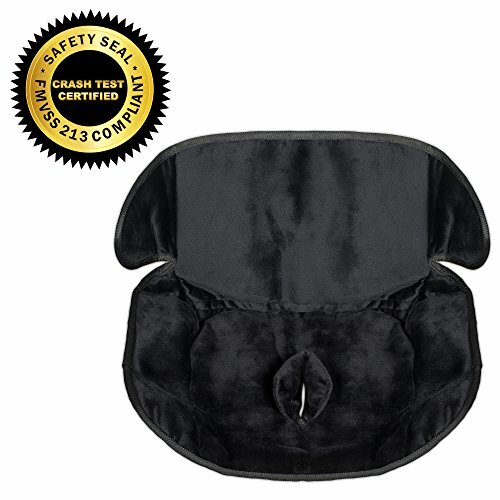 This Car Seat Waterproof Pad is soft and plush for maximum comfort. PEACE OF MIND -When you click the buy button you're going to receive this car seat piddle pad in a few days and have guaranteed yourself a stress free environment in the car with your little one! This waterproof car seat liner will ultimately keep your child's car seat dry. Few seat savers for car seats instill the confidence to acquire the fundamental skills your toddler needs to thrive and succeed with Potty Training. This Car Seat Car Protector is protected by a Full Lifetime Guarantee. If you have any questions about this product by Silverflye, contact us by completing and submitting the form below. If you are looking for a specif part number, please include it with your message.